We booked our summer vacation for next month. We will be traveling when I turned 40, yay! That would be an exciting journey for all of us. We will be going to a state that all of us have never explored yet. I set foot on this state several times already but only in the airport so this would be our first time to enjoy the beautiful state of................................. That would be revealed after our vacation lol. Me and the kids are all excited. I would like to give thanks to Eat Smart for sending me this Precision Voyager Digital Luggage Scale, an easy two handed operation that is really useful for travelers. It has a soft grip handle, a double strap and easy clip buckles. It has a large backlit LCD with a Lithium battery included. It is compact and lightweight and can carry a maximum weight of 110 pounds. As you can see in the photos, it is very easy to use. all you need to do is attach it at your luggage handle and lift it to see how much weigh you are carrying in a luggage. For my empty luggage alone, ,it weights 11.7 lb. already. Traveling with two kids is a bit challenging as you have to bring extra stuff that they need during the trip including extra clothes, books, coloring books and crayons, board games and other travel kit. With those extra things, we sometimes pay extra amount when our luggage is overweight. Having this luggage digital scale would help us determine the weight of our luggage hence would eliminate the chance of paying for overweight luggage charges. 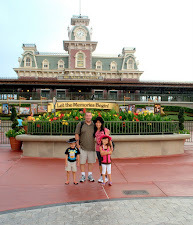 Photo was taken two years ago when we had our vacation in Disney World. Check out Eat Smart through the link I have provided above, they not only sell digital luggage scale but they also provide bathroom and kitchen digital scales. Thank you once again Eat Smart for giving me a chance to review one of your products. Disclaimer: Products mentioned above was received for FREE in exchange of a fair review. NO monetary compensation was received in facilitating this review. That is the neatest thing I have ever seen. I am always trying to figure out how much things weigh. Thank you for sharing will have to get one before our next trip. I really think this is a great product! If you travel at all this is a necessity as airlines are charging for luggage now. I have the same issue like you do too. Knowing we are visiting PI, we want to bring as much as the capacity in our luggage, and i never reach the limits. i wish to get this asap before our vacay we could have bring more stuff for the family. but i got it now and i'm ready for another international travel. I like to travel myself and I could really use this kind of device to avoid exceeding my baggage limit. Great innovation. at least at ease ang travelers not worrying about baggage load. This is very good than analog scale. What I like most about this is I can take them with me when I travel. Sometimes, souvenirs can use up more space in luggage and it's sad to pay for overweight bags. Lovely pics sis. Pls post more pics of your trip to Disney! I want to have one like that bec we're always on the go and we exceed our baggage allowance one too many times. It's such an inconvenience to move around your other stuff from one luggage to the other and risk the chances of exposing what's inside like "undies" hehehehe. Wow! That device is really helpful for every traveler around the world. Awesome!! This is a very good tool for all the travelers out there. This is such a big help. This is a must have for travelers to get the exact weight of their luggage all the time just to avoid penalties. I wish I have known this then i will be able to pay additional fees for excess luggage. Maybe next time, thanks for sharing it! Oh wow! I need one hehehhe. I think this is a must have especially to those who loves to travel. This is so cool! I wish I can have one like that too so that I won't worry if my stuff are of the required weight or not especially when I fly. That is a neat little device that is very useful. It helps you keep track of how much luggage weight you have. That is true, traveling with kids sure needs a lot of preparation and a lot of extra this and that. Sounds like an exciting trip and mommy, for someone who is turning 40, you sure make 40 look good. :) Advance Happy B-Day! That is a handy-dandy traveler scale. I want one too so we can just scale our luggage when we go on vacation. this one is very important since you have to check the weight of your luggage at home so as to avoid over weight. That is one convenient scale and I should have one of those because we are frequent travelers! This looks handy and easy to use. I'll definitely check where I can purchase this so checking the weight of our luggage will be easier the next time we travel. That is very cool. I would need that when I go to the Philippine not to go overweight and pay extra bucks at the airport.